Okay, you’re a Warrior and you just logged in for the first time after patch 7.0 dropped. Possibly for the first time in months. Your talents look different, dual spec is no more, and your glyphs are gone. You may be feeling a little lost. What do you do now? 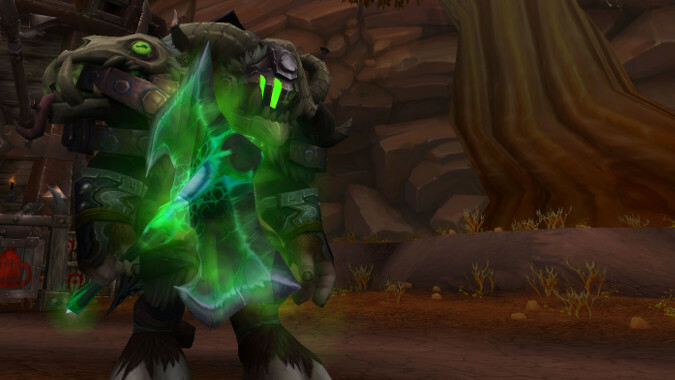 For those of you who haven’t been keeping up with all the latest news from the Legion beta, let’s take a look at what’s different with the Warrior class and specs so you can hit the ground running. For starters, need to get used to the new specialization and talent systems. 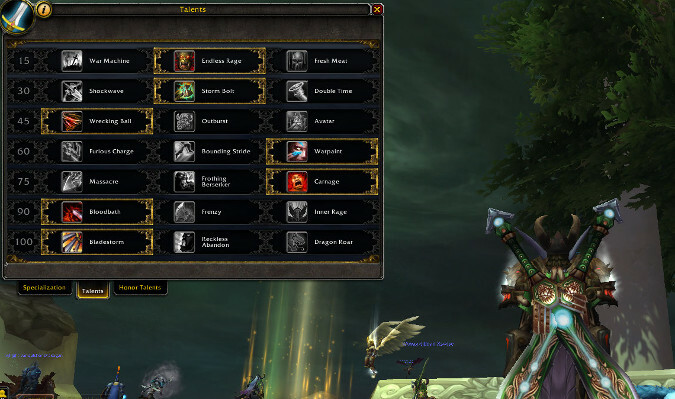 Instead of dual spec, where you could spec Arms/Arms, or Fury/Fury, or Prot/Prot and have two utterly different talent set-ups for the same spec, you now can switch between any one of the three specializations. So now you’re not an Arms/Fury Spec Warrior, you’re a Warrior who can be specced Arms or Fury or Prot. You can switch any time you’re out of combat and your talents and button bars will automatically swap to your previous setup in that spec. If you remember the Warlords pre-patch, get ready for more of the same in terms of ability pruning. Several classic Warrior abilities are gone or combined. Battle Shout is gone as is Recklessness — though there’s a new cooldown named Battle Cry that works like a heavily redesigned Recklessness. An exhaustive list of all the changes is beyond the scope of this post, but here are some highlights. Stances are gone. That’s right — when you log on after patch 7.0 drops, you’ll have to get used to stances being nonexistent. There’s a talent named Defensive Stance, but it bears little resemblance to the current tanking stance. Fury Warriors lose Single-Minded Fury. You’ll gain two ilevel 655 green 2h weapons, so if you have access to better ones, get them ready for patch day. Fury gains Rampage. It costs a lot of rage (although you can talent to reduce that cost) but it hits like a tank being driven by someone you wronged. Wild Strike is replaced by Furious Slash. It generates rage and buffs Bloodthirst’s crit chance until it finally crits, so you’ll hit it to fill the spaces between BT’s. 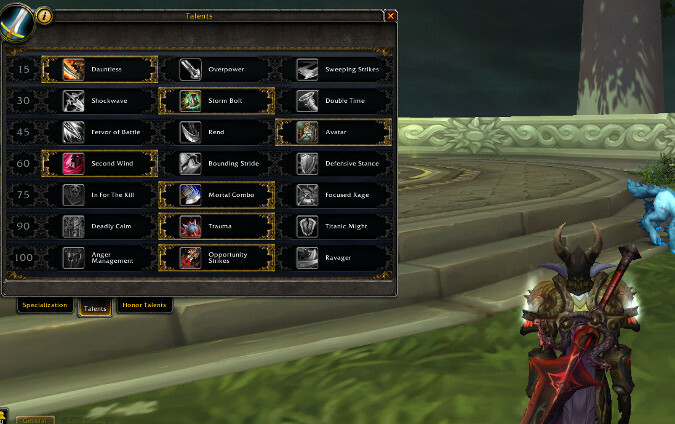 Heroic Strike is gone, Prot Warriors. There’s also been a significant talent reorganization for all three specs. Some talents are gone from some specs, brand new ones added, and in the case of one talent (Bladestorm) it’s now baseline for Arms but a talent for Fury and gone entirely from Protection. Rather than try and break down all the talent choices — it’s a lot, and probably best served in posts about each spec — I’ll give you a quick and dirty talent selection for each spec and explain why I made the choices I did. I went with this spec. It’s a bit of a generalist spec, neither guaranteed to do maximum damage in a raid nor is the ultimate at either single target or AOE. The reason I chose the talents I did was for ease of use — we’re all going to be doing some relearning and it’s easier to do that with a spec that doesn’t have too many added buttons to hit, which is why Overpower and Rend didn’t make the cut. I chose Dauntless because it’s a basic rage discount, it doesn’t require you to hit a button to use it, and I feel the version of Sweeping Strikes available in 7.0 is really underwhelming. Sure, it’s nice for MS and Execute to hit nearby targets, but if I want AOE, Dauntless gives me more rage to use on Whirlwind. Double Time was a marginal choice. I love Charge and I love being able to charge twice before putting the ability on cooldown, but I Double Time it because Shockwave feels redundant when Bladestorm is baseline. Plus I took Trauma, so Whirlwind put bleeds on everything. But I could see using Storm Bolt instead of Double Time. I chose Avatar because it’s a nice DPS cooldown and it doesn’t make you use Whirlwind in single-target situations or force you to track a bleed. I picked Second Wind because it works very well with Victory Rush (basline Arms/Prot ability). It will keep you alive while killing multiple enemies, and once combat ends, Second Wind will heal you back up to full so that any mob that stumbles upon you won’t find you weakened. I’ve used this to good effect in the beta thus far. I picked Mortal Combo over Focused Rage or In for the Kill because it’s a much easier ability to track than FR and IFTK is really an Execute phase ability. Mortal Combo basically means you can hit MS twice after hitting Colossus Smash, and that’s pretty sweet, but I suspect In for the Kill will easily overtake MC in terms of damage in boss fights, especially with longer Execute phases, and Focused Rage is fiddly (you have to track stacks) but likely will surpass Mortal Combo in damage as well. Trauma buffs Slam and Whirlwind, two abilities you’ll be using anyway, and I generally prefer it to Deadly Calm or Titanic Might. Opportunity Strikes I picked because I didn’t feel Anger Management was resetting Battle Cry fast enough and Ravager is very much an AOE talent — with Whirlwind buffed by Trauma and Bladestorm baseline I didn’t feel like I needed it. I went with this spec but I’m still a bit displeased by Fury’s survival options. Bloodthirst heals more than it does on live, but not nearly enough to make up for the loss of Victory Rush, and Enraged Regeneration is on a two minute cooldown which is an eternity when your health is dropping. I really want Victory Rush back for Fury. I went with Endless Rage because it’s a flat increase in your rage generation — the other two are nice if their conditions are met, but ER just gives you more rage, and that’s always compelling. I picked Storm Bolt for Fury over Double Time because you’ll end up needing that stun to stay alive when grinding/questing. I have thanked that stun so many times playing Fury on the beta. I chose Avatar again because, you know, big giant stone form is cool, but honestly all three talents on this tier are compelling and I could easily see picking Outburst instead. Warpaint I picked because I simply hate that Enrage increases the damage Fury Warriors take. Carnage is there because Rampage is a high damage ability that’s really fun to use but that 85 rage cost makes me wince just looking at it. I picked Inner Rage because I like being able to hit Raging Blow on schedule instead of waiting for a proc. Frankly, while I do think it’s nice to keep the rotation simple when you’re just starting out, without Inner Rage your single target rotation would basically just be Bloodthirst and Furious Slash until yo hit enough rage for Rampage. Having another button to hit livens that up. Finally I went with Bladestorm because it’s Bladestorm, and also because it’s nice to have a big AOE attack that costs no rage when you really need one. Dragon Roar is a viable replacement if you’re not as fond of Bladestorm as I am. I would be willing to argue that Protection is the most improved spec between early alpha and right now on the beta, but that doesn’t mean I’m happy with it — damage still feels low and for a tank it still feels squishy. 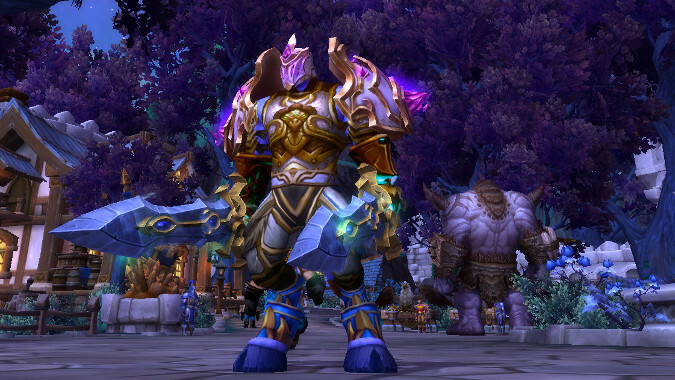 Defensive Stance being gone feels like a blow to Prot’s identity, and I don’t know if I’ll ever get over losing the coolness of Gladiator Stance. I took Shockwave because it’s freaking Shockwave. 4 second stun, cone frontal attack, I’ve loved using Shockwave as a tank ever since it was first introduced. I’ll likely never not take it when I’m speccing to tank, so it doesn’t matter what the other two choices are. Warbringer is tempting, but not tempting enough to make me give up Shockwave. Impending Victory is a nice leveling/questing talent, but for the month that we have patch 7.0 but aren’t in Legion yet it might not be as important. I’ve gotten a lot of use out of it on the beta, though: it kept me alive through a couple of hard fights. Ultimatum makes Focused Rage (which essentially replaces Heroic Strike as a DPS rage dump) free, which is nice if you want to use your rage on stuff like Ignore Pain or Shield Block instead. Crackling Thunder I picked because I prefer my TC hitting even fairly far away mobs, but Bounding Stride is a very competitive option if you need high mobility for a fight. The entire level 75 tier is excellent, frankly I just picked Indomitable because I like the consistency of its effect. Any of these talents would work. I like how Booming Voice makes Demo Shout more effective, and I went with Anger Management for Protection because it reduces the cooldown on Battle Cry, Last Stand, and Shield Wall, making it much stronger for Protection. A lot has changed and we’ll go into more detail on each spec in the weeks to come. 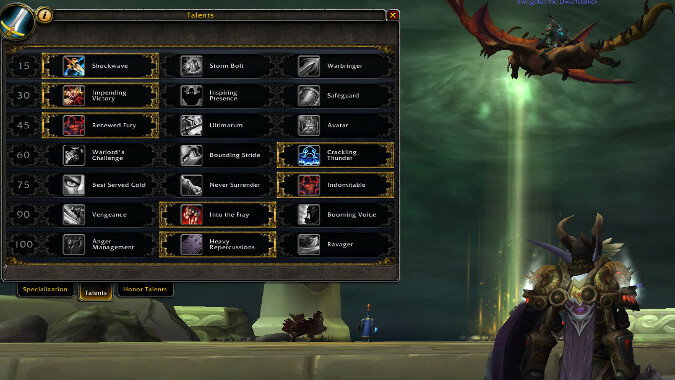 The purpose of today’s post is to serve you as a foot in the door, letting you know what to expect and how to get yourself in shape for the class changes when 7.0 drops. Warriors will adjust, of course, we always have and we always will. Now get out there and hit something.